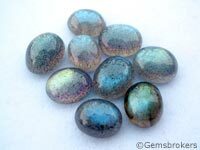 As the labradorescence effect is visible only from an angle, the challenge for the labradorite cutter is to orient the stone in order to maximize this effect when the stone is face-up. Labradorite is often heavily fractured along the twinning planes, and this makes the stone fragile and difficult to set in jewelry. Generally the colors seen in the labradorescence are blue and green, but some specimen exhibit full spectrum colors.